Arancini meaning “little oranges” originated in Sicily and are considered the first Sicilian take-away food. Besides resembling them, arancini have nothing to do with oranges; they are fried balls of risotto. Dating back to the 10th century, arancini were introduced to Sicily by the Arabs who used rice and saffron in cooking. 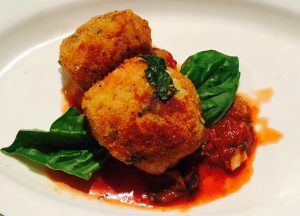 Arancini are traditionally stuffed with meat and coated with breadcrumbs. However, you can make arancini with different fillings, like pancetta, basil, peas, spinach, porcini mushrooms and mozzarella. A gluten-free options, would swap the breadcrumbs with cornflour. For a sweet version, you can even cover them with sugar and cacao. Each year for the festival of Saint Lucia, which takes place on December 13th in Palermo, the streets are filled with carts and stands featuring hundreds of arancini that are prepared for the occasion. I’ve written an easy recipe that features a small mozzarella ball insides the fried rice ball. Cover with marinara sauce and garnish with basil. 1. Whisk the eggs in a large bowl until smooth. 2. Add the rice, basil, Parmesan cheese and 1/2 of the breadcrumbs. Use your hands to combine the mixture. 3. Form the rice mixture into small balls. Use an ice-cream scooper to keep the size uniform. 4. Place the remaining breadcrumbs on a plate. 5. Insert a mozzarella cube into each rice ball. Enclose the cheese completely. 6. Roll each ball in the breadcrumbs. 7. Place the arancini on a baking sheet and refrigerate for 30 minutes. 8. Heat about 1 inch of olive oil over medium heat. 9. Fry the rice balls 4-5 at a time. Turn with tongs to fry all sides (about 4 minutes). 11.Serve immediately with hot marinara sauce and garnish with a fresh basil leaf.